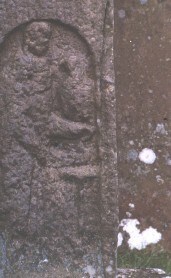 View of lower panel on west face of stone shaft, dated to the first half of the eighth century. A round-headed panel edged at the sides by a fine roll moulding. This panel encloses a standing figure. He is half-turned, with his right shoulder facing the viewer. His feet are pointing to the right, but his head is facing out. He has a long rod or stick in his right hand, pointing to the ground. His left arm is extended in front of a front-facing bird. There is a T-shaped object underneath his outstretched arm, at about thigh level. He is wearing a cloak-like overgarment with a double 'frilled' feature around the neck. The bird's head is very difficult to distinguish.